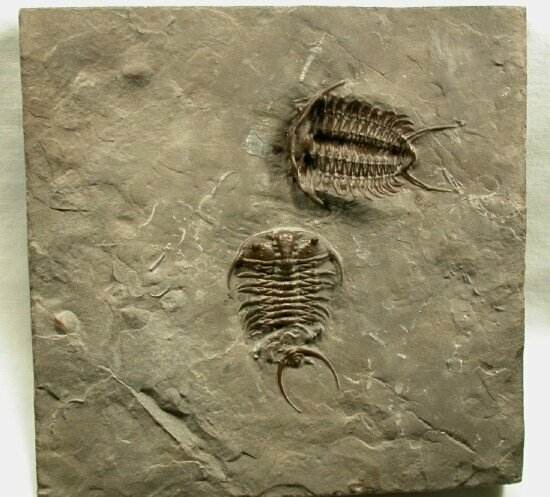 This plate displays a rarely seen example of a pair of trilobites found in the Middle Ordovician Trenton Group deposits of Neuville, Ontario, Canada. This one is different from most trilobites of the region in large measure due to the sweeping genal, pleural, and pygidial spines. 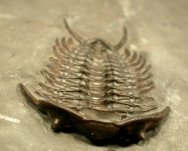 The spines presumably in addition to a deterrent to predators probably served to keep the trilobite near the surface of the substrate, much as snowshoes do. 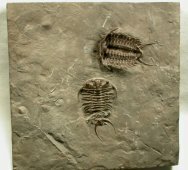 The specimens are very 3-D one has been preserved dorsally while the other has been preserved in a ventral orientation. 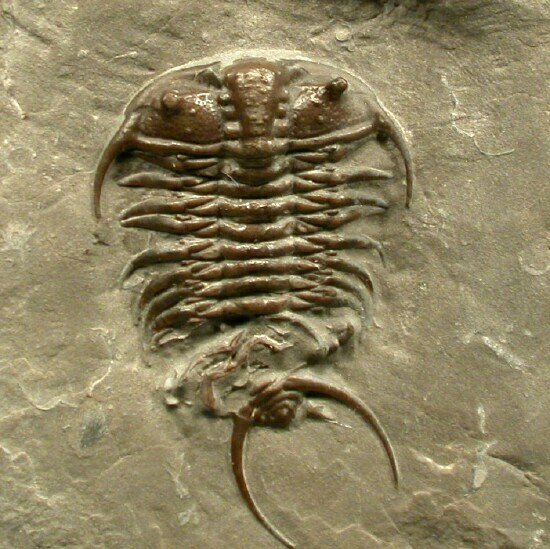 Based upon the fact that the dorsal example has some disarticulation to the distal portion, one would suspect it was deposited first, and had some time to degrade before the second specimen came to rest on the seafloor, only to be quickly covered by sediment. 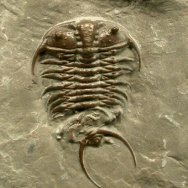 This fortuitous set of circumstances allows you to see many fine details of the ventral structure of the trilobite. 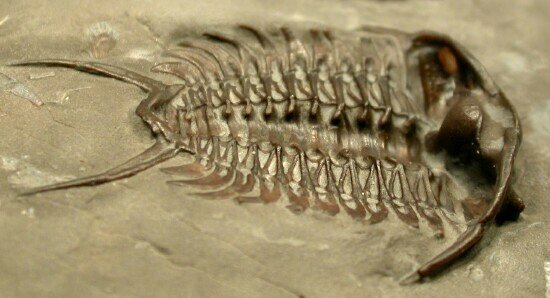 The hypostome is present, the structure that served as the anchor for the mouthparts. 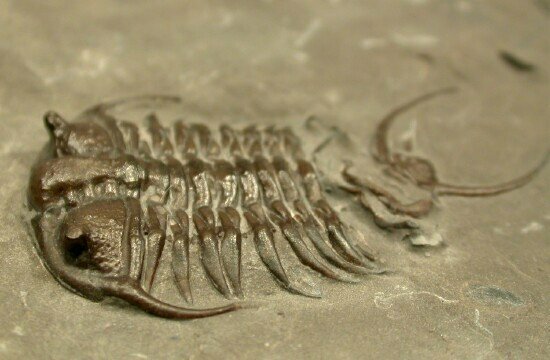 Its presence is an indication that this was an intact trilobite, not a molt that was preserved. 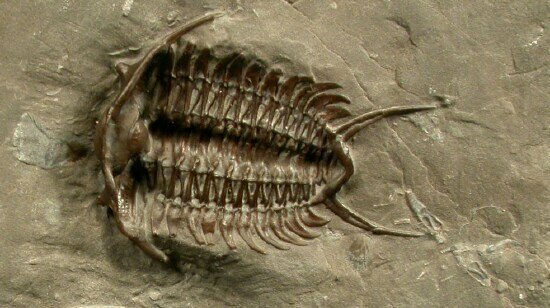 Notice also the crisscross bracing seen in the closeup of the ventral trilobite. 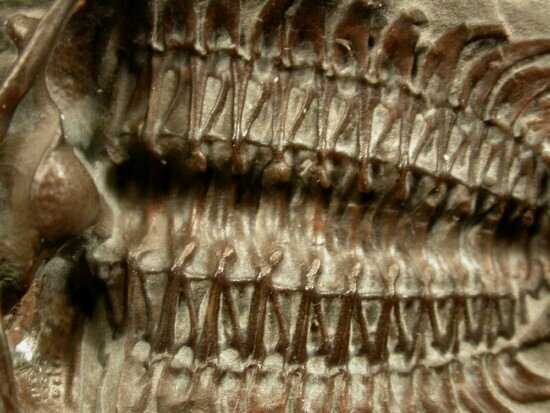 These structures are termed apodemes, and are thought to have served as attachments for muscles. The fact that they are so reinforced is thought to be indicative of strong muscles used for swimming, crawling, and swimming. 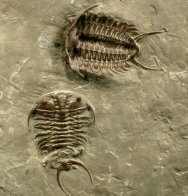 This taphonomic oddity allows a most unique opportunity to study many aspects of the exoskeletal structure of this striking trilobite pair.